Balance Transfer 0% on balance transfers for 18 months, 2% balance transfer fee applied. The Bendigo & Adelaide Bank Low Rate Mastercard has a moderately low annual fee, moderately low interest rates, and a moderate number of interest-free days. Unlike many other credit cards, this card calculates interest from the statement date rather than the purchase date. The card charges a moderately low fee for late payments and does not offer a rewards scheme. While the Bendigo & Adelaide Bank Low Rate Mastercard does not have an associated rewards program, card holders are granted access to Mastercard Priceless Cities, which gives members exclusive offers in cities around the world. The card also comes with 24/7 fraud monitoring, which observes your card for fraudulent activity. The Bendigo & Adelaide Bank Low Rate Mastercard also has a no liability policy, which means card holders are not held responsible for unauthorised transactions. The Bendigo & Adelaide Bank Low Rate Mastercard is best for potential card holders who want low rates and reasonable fees. The card boasts relatively low interest rates and a moderate interest-free period, which may be an incentive for those who struggle to pay their credit card bill in full each month. Unlike other cards, this card calculates interest from the statement date rather than the purchase date. This card also charges a moderately low annual fee, which may be attractive to customers who wish to minimise costs. The Bendigo & Adelaide Bank Low Rate Mastercard is not a rewards card, which means that potential card holders in search of rewards should consider looking elsewhere. The card does not earn points on eligible purchases, nor can it accumulate frequent flyer points. 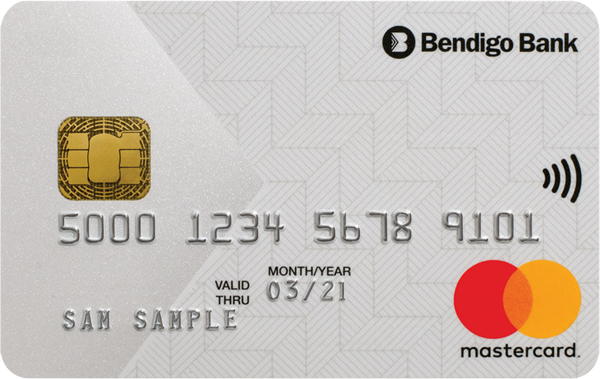 The Bendigo & Adelaide Bank Low Rate Mastercard may be a sensible choice for budget card holders. Customers who tend not to pay their bill in full might appreciate the moderately low interest rates as well as the card’s policy of charging interest from the date of the statement instead of the date of the purchase. The rates, as well as the moderate number of interest-free days, may help budget card holders save money over a number of months. However, the Bendigo & Adelaide Bank Low Rate Mastercard provides few advantages to potential card holders who pay their bill in full each month. The card does not have a rewards scheme, which may deter those who want to earn points or frequent flyer miles for their purchases. Customers looking to minimise associated fees may be better off with a card that does not charge an annual fee. Customers can apply for the Bendigo & Adelaide through a secure online application. To be eligible, you must be at least 18 years old and be an Australian citizen or permanent resident. You must also have a good credit rating. While applying, you’ll need to provide personal information including photo identification, as well as financial details. Customers who don’t wish to complete the online application can also apply over the phone or at a Bendigo Bank branch. Bendigo & Adelaide Bank’s history spans over 150 years, with their beginnings linked to two separate banks in Bendigo, Victoria and Adelaide, South Australia. Both banks began as building societies before joining forces to become a larger Australian financial institution. Bendigo & Adelaide Bank now offer a range of financial services, including credit cards, bank accounts, personal loans, insurance and superannuation. Bendigo & Adelaide Bank serve over 1.5 million customers across the country. The numbers on your credit card actually follow a universal standard which is used to identify specific functions. Each credit card has a different amount of numbers: Visa and Mastercard have 16, American Express has 15 and Diner’s Club has 14. The first number on a credit card always identifies what type of credit card it is. Visa cards start with a 4, whereas Mastercard starts with a 5 and American Express with a 3. The remainder of the digits represent the account number, including the last number which is used to verify that your credit card is actually valid. Credit cards also have additional verification numbers, which are mainly used when the card isn’t present for phone and online purchases. These are the three-digit numbers on the back of Visa and MasterCard or the four-digit numbers on the front of an American Express card.